Boys Don’t Have Bad Hair Days. Okay, so the zany Frank Zappa probably did, what with his curly hair being as crazy as his music. Anyway, if you have long hair as I do, you do need to brush it regularly. Once a day at a minimum unless, like lazy old me, you don’t and wind up with nasty tats that are slow and not a little painful to straighten out. A decent conditioner will help here, too. Mine is an organic mix of calendula and aloe vera. It works and keeps my hair nice and flowing. But this means I also have to wash my hair, which I do twice a week. Since it’s long, it does take quite a long time to dry. Hair for men is much, much easier. Hendrik’s attitude is to go to the barber and ask for it to be cut off. What with some Dutch barbers being better than others, the results are varied. Not that this bothers him greatly. Washing and drying his hair are easy-peasy. A quick wash and rinse under the shower, a flick of the towel and bingo! His hair is as good as new. He doesn’t need to brush his hair, as it’s rarely over an inch long: this means tangles are something he never thinks about. Hair brushing is only when he has to see his sister. I can’t imagine a scientist being any different. Short hair and no experience of tangles. Scientists are regular kinds of people, and if they have long hair, they will be as rare as a Zappa in the world of music. The point is that they aren’t the kind of people who think of looking after their hair in any particular way. 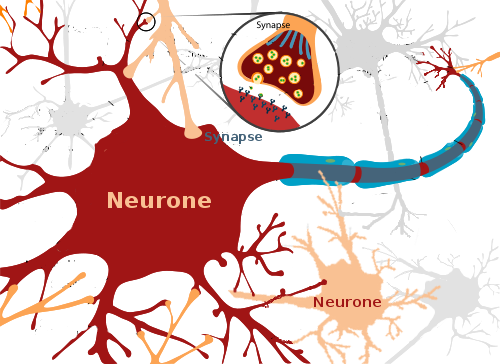 Because this post isn’t about hair: it’s about neurons. The astonishingly powerful cells in our brain that when linked together are an expression of our ability to think. I know this is backwards to modern scientific thinking, bear with me: there is method to my madness. In a post from long ago, I spoke of how neurons make and break their connections according to our thoughts. Just reading something that you are unfamiliar with and have to strain your brain to think about will be re-organizing those neuronal patterns. Remember that with 100 billion neurons, each with as many as 30,000 connections, you will have around 500 trillion connections – there is a lot of room for movement here. Your brain couldn’t be more unique. So let’s put this the other way around. Let’s not speak about what happens when we use our brains; let’s look at what happens when we don’t. It is important to note that scientists have this the wrong way around, and see thought emanating from the neuron. This means their thoughts are dependent on their neurons, not the neurons on their thoughts. The implications of such thinking are extremely dangerous as it leaves the scientist – along with those who believe them – helpless to change their patterns of thought. … is all there is to perceive. Because they’ve never had to deal with long hair which reveal the problems inactivity brings. They have never perceived it and thus never have to think about it. The key here is that they simply don’t need to: and it is this ‘I don’t need to’ business that is the key to unravelling the conundrum of consciousness. Because if you want more consciousness, you have to reach for it. That I must leave for another post, suffice it to say that you have to want it. A scientist, like so many others, simply doesn’t need to. So what happens to the ordinary dyed in the wool shorter-haired scientist who is only interested in keeping his job? All it means is that he’s prepared to do his job but nothing more than that. Nor does he need to look beyond the scope of his job because that’s what science is in our day and age. Dig deeper, not wider, as it were. Work with what you have and don’t look elsewhere. Mainly because the big pharma companies won’t pay for that kind of nonsense. This process leaves rather a lot to be desired. Because leaving neurons inactive means they aren’t being actively used. That is to say, they aren’t being regularly hooked up or unhooked in order to find somewhere else to connect to. I was writing a post for my private blog the other day and what I wrote was something I had literally not thought about until that moment. In this case, some neuronal patterns were altered and the odd one or two inactive areas of my brain being entered into. The shorter-haired scientist never thinks about such things, so his neurons are hard-wired through habitual patterns of thinking and it is then difficult to change their static state. The neurons that are left unused have nothing to do. A neuron that is in the process of dying. Its long strands are now becoming dessicated and twisted. This is where the scientific research in dementia has shown that the structure of the neuronal ‘tentacle’, the part that connects with other neurons, becomes brittle and the fibres that live within the hair break into pieces. That is fair enough, but the scientist remains at this point; what they do not do is look at the whole picture. Even when they photograph the brains, all they can see is inside the neuron, as it were. They cannot see the effects, as it were. Leave alone the process that I have described – that is to say, when left unused, they get tangled. Thus, dementia is a disease of those who aren’t interested in consciousness. In leaving entire swathes of their brains unused, this very lack of use means the neurons enter the process of death, the lead up to which is that they get tangled as they dry up. It really is a case of ‘use it or lose it’. A view of tangled neurons – and the plaque (which I have not yet discussed). If a scientist can see this problem, it is already ten years too late. The problem with dementia is that the patient is utterly unaware of what it is they’ve lost. This, as mentioned, is the result of a long life of disinterest. Getting someone to become interested in something that they find boring and irrelevant is far from easy. In my last post, ‘Live Wires’, I have spoken of how this process has become extremely unhealthy. Speak to such a person and all you get is the blank stare that you get from a cow in an art gallery. Getting through to such a person now requires a force of circumstance that will damage them, derange them. As is the case with post traumatic stress disorder. Dementia really is ring fenced. Meet this and you really will have the feeling of hitting a wall. Those who are ready and willing to converse at any time and with any person, no matter who or what they are, will find their minds taken to areas they could not conceive of themselves.This is the key to the riddle of consciousness, it is the answer to dementia. Yet it is that which most people push away with all the energy that they possess. The question is why they should wish to push away the very thing that would heal them. I don’t know who this Zappa fellow is, but I like the cut of his jib! Seriously, though, a very useful post. His most beautful song Lucille named my puppy!